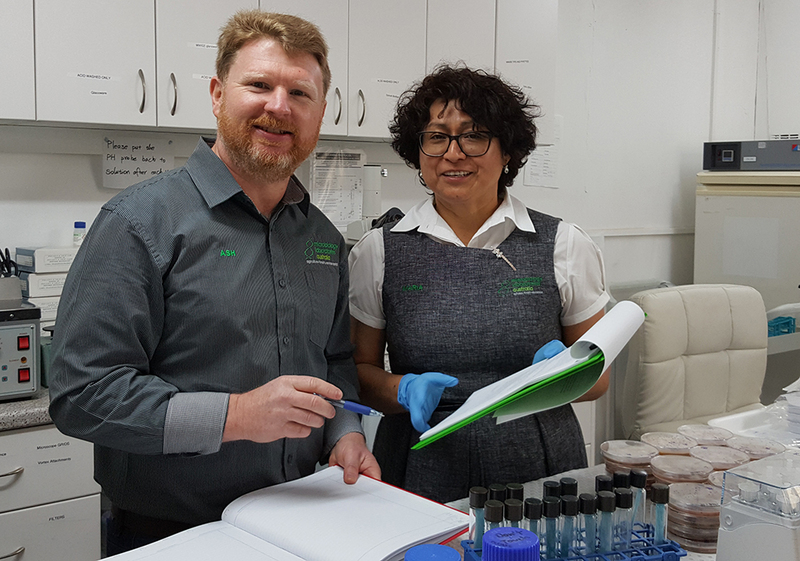 We provide world-class commercial microbiology analyses for private, commercial and government organisations across Australia and around the world. Our clients include farmers, agronomists, natural resource managers, forest managers, fertiliser manufacturers and government. We help those clients make informed decisions about the use and management of microbiology in soil, water, compost, fertilisers and other media. We are committed to education and training to people, groups and industry to increase knowledge, solve problems, meet research and development aims and obtain research funding. We’re passionate about developing and refining the use of microbiology in agriculture, natural resource management and fertiliser production to the benefit of our primary industries, productivity, health, technology and environment. We bring proven, scientific, research-based technology to our customers in a clear, concise, no-nonsense manner to help them make informed decisions. Our directors offer deep experience in agriculture research, production and microbiology in both the public and private sectors. Dr Ash Martin is the Managing Director of Microbiology Laboratories Australia (Microbe Labs). His broad range of experiences gives him a unique ability to apply science to practical problems. From working in orchards as a boy until completing a PhD in applied soil microbiology (Adelaide), Ash has worked as an experimental scientist (CSIRO), postdoctoral researcher (Monash), technical officer (NSW Agriculture) research officer (CSR Wood Panels) agronomist, farmer and nurseryman. Dr Maria Manjarrez-Martinez is currently the Research and Analytical Services Manager and a Visiting Research Fellow at the University of Adelaide. Microbiology Laboratories Australia has current links to The University Adelaide, Central Queensland University and government departments in various Australian States.